Another year come to a close and 2013 was certainly the rise of the Social Networks! Viral video stars now rival Hollywood popularity (for their 15 minutes anyway) and marketing companies are finding that social sharing is the best way to get your message out. With so many people sharing their lives, thoughts, and art via social networks, the internet has become a cornucopia of personal information. Most for the better and some for the worse. Let’s take a look at the highs, the lows and the stats behind it all. #1 Viral Video – What Does the Fox Say, Ylvis (source: Google). One of my personal favourites and kid friendly too! Norwegian comedy duo Ylvis created the video to promote their new TV season but the video caught on globally and became the most shared video of the year. But seriously, what does the fox say?? If you are a fan of YouTube and viral videos, then you’ll want to watch the YouTube 2013 Rewind video. It is a 5 minute mash-up of the most popular videos and some new footage featuring YouTube stars of the year. Just in case you’d put the Harlem Shake or Prancersize behind you. Most searched news on Bing – Royal Baby Birth. Want to know what topped the Google Search lists? Check out Google’s Top Searches of 2013, all categorized for you by movies, diets, celebrities, etc. Top overall searches? Rob Ford makes the top 10. Also the Royal baby, Batkid and Nelson Mandella. Top “How to” people wanted to learn? How to Twerk. Dictionary.com’s word of the year was Privacy. Oxford dictionary picked Selfie. What other social-network-derivied lingo dominated popular culture? FOMO (Fear of Missing Out) and Cat Bearding. When you give people a public forum and no filter, sometimes things go poorly. My vote for least tasteful social trend goes to the Tumblr Selfies at a funeral, where people took pictures of themselves on their way to or at funerals, sometimes with the person who had died. Media outlets weren’t always on the ball either Here are the worst tweets from the media in 2013. 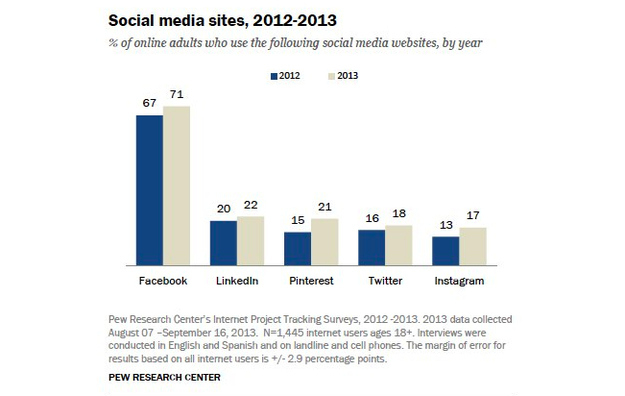 73% of online adults (18+) now use a social networking site of some kind. Facebook is still #1 but a striking number of users are now diversifying onto other platforms. Google+ (not pictured below) is #2. 42% of online adults now use multiple social networking sites. Instagram users are nearly as likely as Facebook users to check in to the site on a daily basis. Google+ – membership is growing and with tie-ins to YouTube and the other Google tools, people are finding new value in this network. Video – Watch for a lot more of this medium. YouTube, Vine, others. Videos are easy to make and edit and have enormous power in terms of engagement and ability to communicate. User created content – one of the new marketing buzz words. In addition to videos created by production companies and professional photographs, the world is loving personal content including blogs, videos and photos posted publicly. So have you jumped on the band wagon yet? Even without an account, you can view public Facebook pages, Google+ pages, YouTube videos, Tweets, Tumblr blogs etc. And if you are concerned about privacy, (inserting shameless plus here) we can help! Happy New Year and here’s to an exciting 2014 in social networking ahead! !